All the credit for this one goes to The Mighty Dan Humphrey, our Senior Art Director, who not only wrote the definition, but came up with a great color combination as well. Maybe he was listening to the red, white and black clad band the White Stripes at the time for inspiration. All I know is I was really stumped on the colors for this one, and Dan stepped in and took charge. 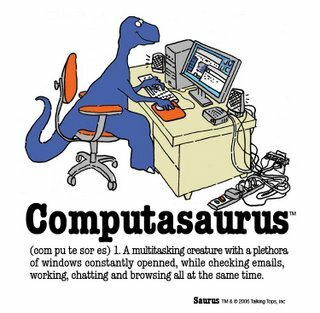 He’s also responsible for many of the definitions on the original Sauruses. I Went to Sirius Satellite’s studio friday. I was invited to watch the Kaiser Chiefs one of my newer favorite bands from England. 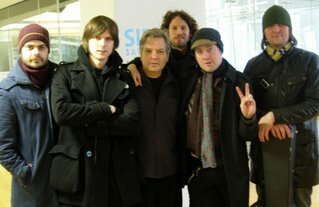 The boys did an interview and played live in the main stage area — an impressive glass-enclosed area to promote their upcoming new record “Yours Truly, Angry Mob.” They performed their 2005 UK hit “I Predict A Riot” as well as new songs “Ruby,” Everything Is Average Nowadays” and the cleverly titled “Love Is Not A Competition (But I’m Winning).” It was difficult to not clap after each song, since I was sitting right in there with the band. One of the best bands to come along in years — Brit Rock is alive and well! That’s me in the middle. Here’s a sketch of a new Saurus. I’ve recently gotten into kayaking. I injured my hip last year, and have been unable to get up on a surfboard, so I needed another activity that involed getting out in the water. 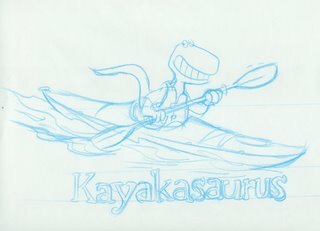 I’m amazed at how many people are kayaking — probably, because it’s relatively easy to get started. It doesn’t take years and years of practice to have an enjoyable experience. I live three blocks from the Navesink River, and less than a mile from the Shrewsbury River. Both empty into the Atlantic Ocean to the east. about three miles from my home. To west, the rivers are fed by tidal estuaries , which are habitats for herons and other amazing birds. I try to get out there several times a week in the warmer weather. 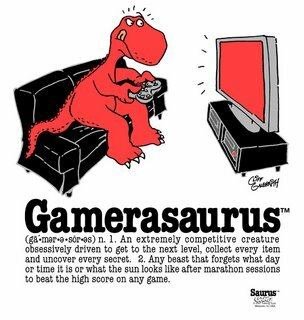 So I guess that makes me a Kayakasaurus. A new Saurus for a new millennium — sounds a bit too dramatic, but it’s been some time since I drew one of these guys. I’ve still got some work to do on the definition, but I’m happy with the drawing. The printer didn’t seem necessary, but I felt a desk and chair might bring all the elements together. Wow, this was way easier when I didn’t really think too hard about what I was doing — I just drew the first thing that popped into my head, and that was usually the design we went with. The final push to make a new Saurus actually came from my father. 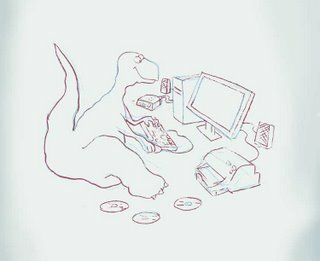 A few weeks ago, he sent me his version of a modernized Computasaurus. 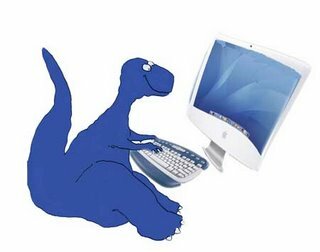 He’s been learning Photoshop and used it to insert a new monitor and keyboard. I thought it was a great choice of color and I was finally moved to update the old classic. 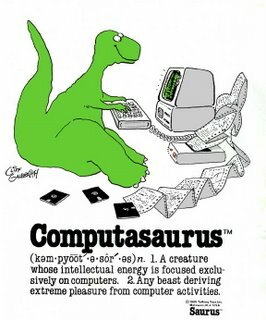 After some digging, we found an old stat of the original Computasaurus. Penned around February 1986, this was the drawing that started it all. 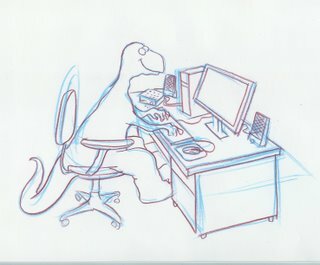 A phone call from a friend who was struggling to learn DOS on an IBM personal computer inspired this sketch. It was done with one single drawing, there were no studies or alternate poses. It just appeared. This site was originally posted on Blogger.com as bloggerasaurus.blogspot.com and up until recently, it was very easy to import a blog from Blogger into a new WordPress blog (which is what I’m using. Unfortunately, I have to import all my posts manually and have no way of preserving the dates of the posts or eveyone’s comments. So for the record, this blog was actually begun in November of 2006, but it will appear to have started February 2007.